Happy New Year Ya’ll | Nan Tubre Writes . . .
Gloire `a Dieu dans le plus haut et sur paix de la terre, bonne volonte’ vers homes. I won’t bore you with the used up clichés about it being a beautiful year or one of the best, etc. You know it was. And I’m sure you were blessed in many ways this year, as was I. Don’t take it for granted, ya’ll. Most of us have an easy life compared to the millions who don’t even have basics like food, water and shelter. Geez, if I want water I turn on the tap. I have more than enough to eat. I climb between warm sheets and blankets each night under a solid roof, out of the elements and away from the city. I am spoiled. If I want something, I go to the store and buy it. Even when I have more month at the end of the money, I still have more than those in, let’s say, third world countries. Why me? Why am I so blessed? To think of my position in life along those terms is mind-blowing. My short-comings and disabilities are nothing. My needs are met even if my ‘wants’ aren’t always met. It’s hard to admit, but even my pets are better off than at least half of the world’s population. Sure, I have difficulties, trials, seemingly insurmountable issues. But they can and are dealt with, not necessarily on a first come first serve basis, but without a doubt fixable one way or another. I can’t imagine it any other way. Again, I am spoiled. I recently read a book by Deb Hunt. 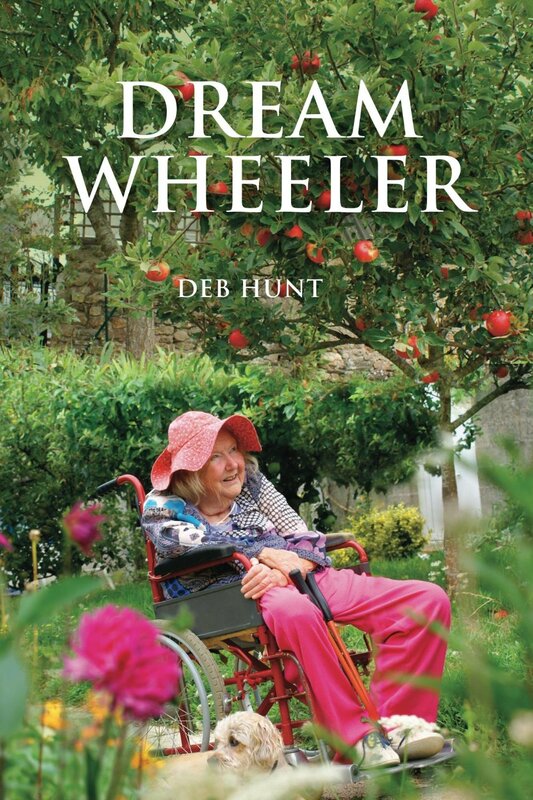 Dream Wheeler is the story of a remarkable woman who started her life over at the age of 61 years. She moved to another country, bought a shell of a house without any useable essential amenities and set about creating the life she wanted. When I tell you Jane started over from scratch, I mean from scratch. And she did it from a wheel chair. Could you do that? Could I? One part of me would love it. Wow, starting from the bottom means there only one way to go but up. Would I have the courage? the confidence? the means? I highly recommend the book, by the way. I got it from Amazon in ebook version. I think now I’m going to get it in paperback. I want to be able to put my hands on it and read randomly. I’m quite sure I would get nearly as much inspiration from it as I do from the Bible or other inspirational writings. So Happy New Year to ya’ll. I know I said I won’t bore you with clichés but I have to say ~ enjoy your life and do your best to make someone else’s better. You can start by praying for peace. Oh. And you might think about giving glory to God. He’s the best. « The Home of Jim and Frances Hurst ~ It’s Christmas In There! My wife and I were just reflecting on how our lifestyle changed from the time I turned 61, over two years ago. So many people I know or read about are working beyond retirement age because they feel they need to, and that may be true in some cases. For those who love their jobs and have few other outside interests, that is a good choice. I think the rest of us can downsize our lives to fit our retirement budgets. The idea that you must have a boatload of savings to maintain a certain lifestyle is a story exploited by financial advisors who want to manage your portfolio. Your book, Dream Wheeler is a fine example of choosing another option. My father was right when I asked him if he wished he had worked beyond age 60 in order to gain greater retirement benefits. He replied, “I’m sorry I worked as long as I did!” A whole new life awaits when you no longer must report for work everyday. Florence and I are living proof. As you indicated, we are humbled by how much we have to be grateful for. Wow that was great, Nan! May me stop and think how blessed I am. I get so busy at times that I forget the many blessings God showers down on me daily! SO thanks for the reminder!